UVa's Special Collections houses fifty-five autograph books belonging to students of the University during the 1850s. These books are collections of well-wishes interspersed with lithographs of the professors. There were two main styles: one book published by Bohn's and the other by an unknown publisher, both specifically for students of UVa. Autograph books functioned much like modern day yearbooks; students would pass them around to get signatures of their classmates and, occasionally, professors. The sentiments were usually highly formal, and would often quote Shakespeare or Scripture rather than reference shared memories. There are, of course, some humorous outliers which make jokes about future wives and drunken revelries. There is even one mention of how boring M. Schele De Vere's French lectures were. The most common thread between all of the signatures is the oft repeated assurance of sincere friendship. Now, these autograph books serve as a record of where students were coming from, which societies they were in, and grant us a glimpse into their lives during their time at the University. Griggs, Christina. 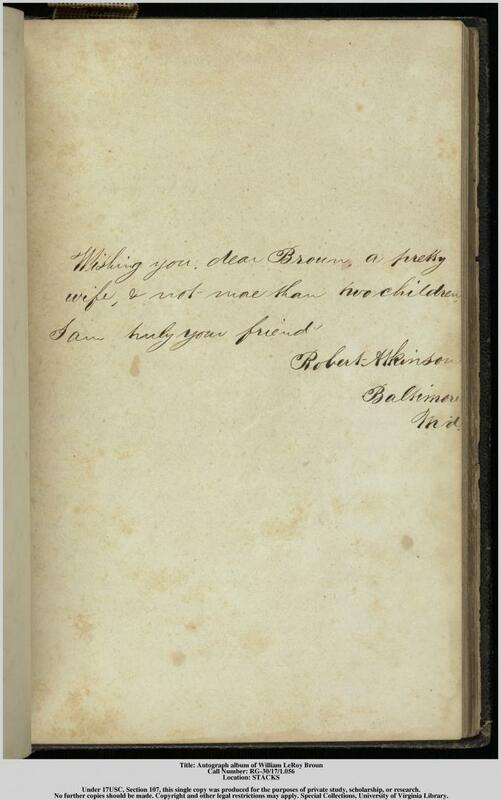 "Introduction to Autograph Books of the 1850s." JUEL, June 18, 2015. http://juel.iath.virginia.edu/node/110.